A Red Deer cross-country skier was attacked by an owl while skiing near Heritage Ranch, resulting in a sore neck and several scalp puncture wounds. A Red Deer cross-country skier had an unwelcome visitor join him on the trails last Wednesday, and he has the sore neck and 16 scalp punctures to prove it. Dr. Miloslav Bozdech, an ophthalmologist, was skiing on one of his favourite trails near Heritage Ranch, when the attack happened. "As I was going down a hill, I felt an impact on the back of my head and sharp pain in my skull ... I spun around to take a look and saw nothing behind me." In the moment after the attack, Bozdech's mind ran through a list of suspects that included moose or other big animals with antlers, a falling tree branch, and even a human. 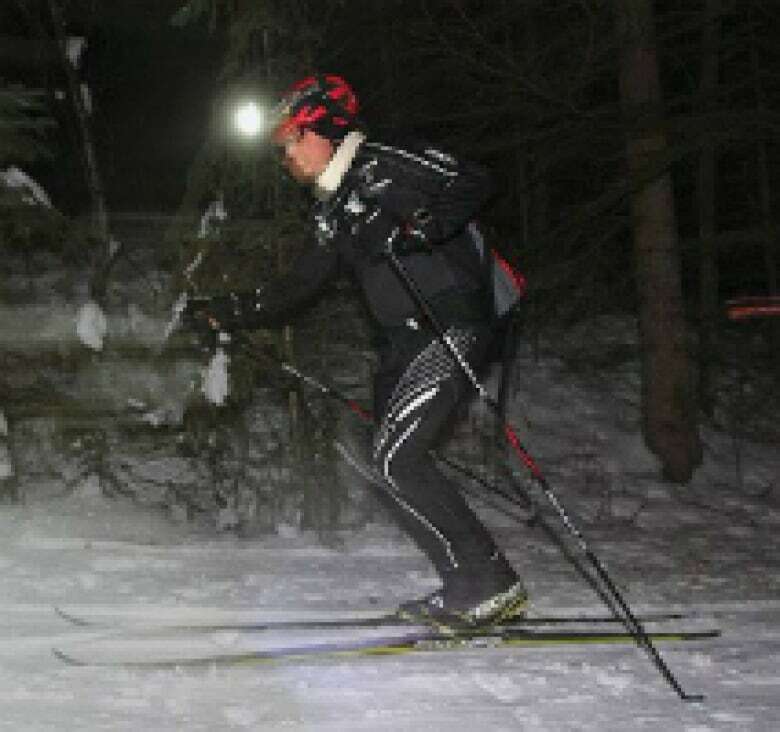 Dr. Miloslav Bozdech skis with a helmet now since an owl attacked him twice during his Monday night ski. 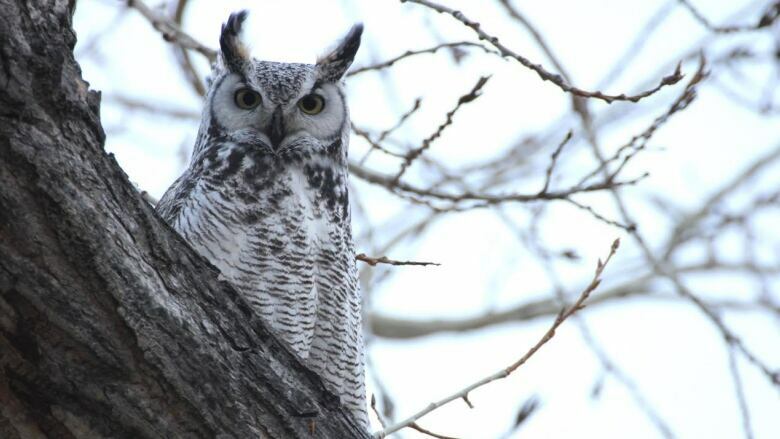 (Jeff Stokoe/Red Deer Advocate) Then he saw the big owl hovering, and it landed in a tree. "At first I wanted to catch it and stuff it like a turkey and have it for supper, to be honest," he told Alberta@Noon host Donna McElligott, "But now in retrospect, there's a conflict between man and nature sometimes, and I just have to respect it." Bozdech kicked the tree and the owl flew off. He felt his scalp, realized his head was bleeding, and resumed skiing. Then the owl attacked him a second time, from behind, ramming its talons into the back of his head. He ended up with 16 puncture wounds to his scalp. Because the owl did not use its talons to rip into his head, Bozdech doesn't think the owl was hunting. But he's not sure why the owl attacked him, but he has a few theories. "The white scarf around my neck…[is] the colour of a bunny in winter, I guess." He also thought his bright headlamp was annoying to the owl, or that it was defending its nesting territory. Bozdech is now dealing with a sore neck and many scabs on his scalp. Asked if he plans to hit the trails again any time soon, he says yes. But he'll equip himself differently. "I wear a helmet now." Not a bird expert, Bozdech thought it was a snowy owl, but has since learned it was likely a great horned owl, which is native to the area. Birding expert Chris Fisher says it's not common for owls to attack people, but when it does happen, it's usually because of the time of year or because it's been startled. "Cross-country skiers and bikers usually are the victims of these things and and most of the perpetrators of these attacks is usually our very own provincial bird, the great horned owl," he said. Fisher, author of Birds of Alberta, also said it's not surprising that Bozdech suffered the injuries he did. The raptor, found in rural areas around Alberta, generally weighs about 2.5 kilograms and has a wing span of about a metre. "I guess it's like getting hit in the back of the head with a pillow, except that pillow would have talons." And those talons are sharp because they are meant to kill mice, rabbits and squirrels. Fisher also notes, though it's early February, this is mating season for the great horned owl and it may have been protecting its nest. "It's not uncommon for a raptor to be quite vicious around their nesting sites." An earlier version of this story said the incident occurred on Monday. In fact, the incident took place last Wednesday.